A wedding held at the end of last month in an impoverished county in southwestern China's Yunnan province sparked wide contempt and disdain after it was exposed by the local media. There are several reasons why it received criticism rather than a blessing. It was held on Oct 28 and 29, two weekdays, at Yongshan county's public security bureau and at another government building nearby. About 60 local policemen and judges served as attendants to nearly 5,000 guests. Three cash counters were set up, receiving almost 60,000 yuan ($8,820) from nearly 500 guests in just half a day. People are wondering what kind of family can afford to marry off their offspring in such a pompous manner. Yes, you may have guessed it: The bride's father is a Party leader of the county's public security bureau. "It's understandable our veteran leader arranged a wedding like this for his daughter," one of the wedding planners, said. He was referring to a deep-seated cultural belief that weddings and funerals are the two most important ceremonies people can have in their lives. The grander the ceremony, the more proud the family will feel. Therefore, we are always willing to put up with those who are so eager to impress that they make themselves a nuisance: noisy banquets at restaurants, a huge fleet of cars that block traffic, or simply a public display of how much money they have got to spend. We understand that people have the right to choose whatever kind of wedding they wish. Yet this particular wedding certainly tells a different story. It shows that public power, if not checked, can be abused. First of all, the work of the local public security bureau had been virtually suspended for two days while its offices were used for the wedding and its staff serving at the banquets. The services that the bureau is obliged to provide - to ensure the security of the public, to police and to maintain public order - were suspended for a private matter. But these services are what people need every day. For one thing, Yongshan, like any other place on the planet, cannot be crime free. According to Yunnan Legal Daily, a woman died at the office of a local official in mid-October while trying to seek compensation for her home that was torn down for real estate development. The cause of her death had still not been confirmed by the end of the month, and therefore should not have allowed for the suspension of police work. As one of the bureau's leaders, the bride's father should have fully understood the duties of his bureau. But he still occupied the building and used the policemen for his daughter's wedding. The official also overtly arranged for his subordinates to collect money from guests and keep a record of how much they had contributed. This is no different from taking bribes in broad daylight. The fact that so many guests had shown up with money indicates they either were trying to seek favors from the official or they feared they would be given a hard time if they did not contribute. What is more, none of his bosses or colleagues bothered to persuade or prevent him from doing so, and this in fact endorsed his abuse of power. There is again a cultural reason behind the endorsement: a wedding is of supreme importance to one's life, and rarely affords another opportunity for such a celebration. This has become an excuse by some officials to take advantage of public resources to guarantee a sumptuous ceremony. To guard against this practice, the Party issued a regulation in December 1989, which stipulates that Party members will be punished for abusing their power to hold lavish weddings or funerals. The penalty will be heavier if they are found to have infringed upon the public's economic interests when holding such ceremonies. As a Party leader of the public security bureau, the bride's father should have been well aware of this regulation. What is more, the reporter, who went to the wedding for a covert investigation, was asked tough questions to verify his identity as a guest and later received intimidating calls. This indicates that the official and his people knew what they were doing could not stand up to public scrutiny. Yet this wedding was still carried out without much consideration of the consequences. It might be that there have been so many officials in the county violating the regulation that it has become very difficult to implement. Yongshan is a State-designated poor county, which means the average income of its people is below 530 yuan a year - that is, less than 30 US cents a day. With this in mind, one can gauge how lavish and unnecessary this particular wedding celebration was. 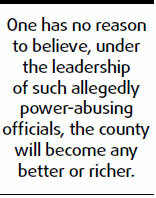 It is the same county where a bribery case was uncovered in March last year. 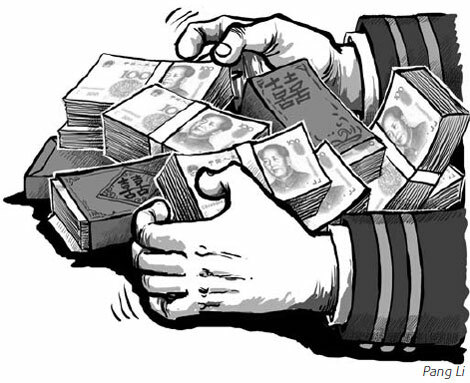 The Xinhua News Agency reported that between 2003 and 2006, the county people's court took 148,500 yuan from 40 criminals to reduce or suspend their sentences. One has no reason to believe, under the leadership of such allegedly power-abusing and corrupt officials, the county will become any better or richer. It was reported on Thursday that the authorities of Zhao'an city, which administers Yongshan county, had sent a team to investigate the case. We hope those who are found guilty will be punished accordingly. The regulation should be implemented to the letter to ensure a clean Party leadership and restore public confidence. Yet punishment alone cannot prevent this from happening again. Abuse of power is the prime source of moral corruption, and it cannot be checked without an effective supervising system. We need such a system to monitor the use of public resources and power, and reduce the opportunities for abuse.